Another case of style over substance? With camera phones getting better by the week, makers of 'lifestyle compacts' must keep convincing the general public that they still need a dedicated camera to take snapshots. While Canon's Ixus range of style compacts is well established, it's certainly not immune to this pressure, and the Japanese giant is fighting back by including a larger LCD on its latest digital camera, as well as other useful extras. The Ixus 65 is certainly a looker with its sleek brushed silver and ebony highlights. The sturdy casing inspires confidence and appears relatively scratch proof too. Indeed, a lot of thought has gone into the über-chic design and the build quality is superb. As befits a compact aimed at the iPod generation, it's got a 'Touch Control Dial' (ie. scroll wheel), which gives an on-screen display of a particular control as you touch it. Image rotation can also be controlled by touching the image on the LCD, which at three inches, is the biggest Canon's ever used on a compact. With 173,000 pixels and up to 15 brightness levels, the screen is perfect for composing and previewing shots, which is just as well as there's no optical viewfinder. The Ixus 65 is clearly aimed at well-heeled snappers with a yen for good design; if you're looking for a power compact under £300 with manual controls, this isn't for you. That's not to say that the Ixus 65 is underpowered for the money, though. Six megapixels for £260 may not sound that great, but Canon's quality sensor and well regarded Digic II image processor delivers smooth, well-exposed images. The camera's fast too, once you're used to the titchy power button - our shot of a vintage car, for instance, was taken while crossing the road. The camera powered up, took the shot and powered down again in less than four seconds. The large LCD also helps with composition, though you need to hold the diminutive Ixus firmly to avoid camera shake. On that subject, it's a real shame that anti-shake technology isn't included. 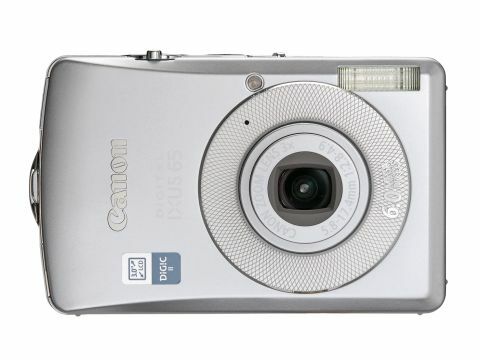 You have to upgrade to the 800IS to get this, though Canon argues that the Ixus 65's high ISO rating of 800 also helps to reduce blur on moving objects. A new High ISO Auto setting automatically sets exposure using the higher range of ISO sensitivities, prioritising faster shutter speeds for reduced blur. Canon also claims the higher ISO rating reduces the need for flash in poorer light conditions. Certainly, being able to go up to 800 helps, but you pay for this with increased noise. Credit where it's due though, the Ixus works hard to keep noise to the minimum, and the unwanted graininess, while noticeable, is unlikely to bother the non-enthusiast snapper that Canon's aiming at. Canon's also banking that the target market isn't that interested in a plethora of controls, as that bumper LCD means that they're limited to the scroll wheel, plus a couple of buttons for Menu and Display. In terms of photo tweaks, it's basic fare - adjusting fl ash settings, bumping exposure up and down, normal and high ISO, and selecting scene modes. Don't expect to get creative with aperture sizes and shutter speed. Fortunately, the auto settings are pretty smart, and a 9-point AiAF definitely helps, as does the smart metering system. Another useful extra is the Image Inspection tool. This simultaneously displays a magnified section of the image alongside the main image, the idea being that you can check the finer details of the shot before leaving the scene. This magnified spot can be moved between AF points.